The queen of the house turned seven years old yesterday (March 25th). Her mother was feral and Scout and her siblings were born under the house of a friend of ours. She’s slept me on me just about every night since we brought her home. We definitely got the pick of the litter! This picture of her is from May of 2001, her first month with us. 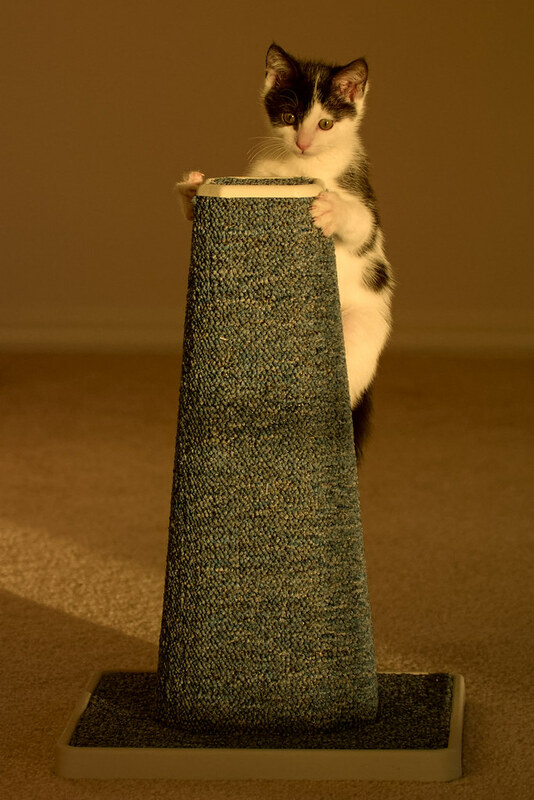 I had a hard time photographing her at this age since she didn’t want to leave my lap when we were playing, but the scratching post gave me a good opportunity. I’d put a little furry mouse on the top and she’d come flying across the room and jump to the top to grab it. On this occasion she knocked the mouse off with her flying attack so it’s not in the picture. This entry was posted in Pets and tagged Scout. Bookmark the permalink.